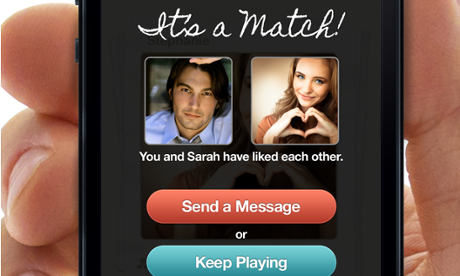 3 weeks ago, a friend (and she's a girl) I'm having a lunch with introduced me to a an app she is using called Tinder. To put it bluntly, it's a dating app, but tinder describes it as a new way to meet interesting people. Yet, the only way for you to connect with someone using the app is by location and face value*. There's not really much you can do with the app. Tinder is basically a messaging app, and for someone to be able to message another person, they should match first. People are matched if they liked each other. But for that to happen, both people must say that he or she liked the other person. Tinder requires each user to login to using there Facebook account. This is to at least have a certain degree of the user's credibility as a real person. This is where also Tinder gets the picture that it will show on the user's profile. Another information that is being taken is their common friends and interests. So, its not just a lll about the face? Apparently yes, there are thousands of users using Tinder here in the philippines and to shove it all on your phone is pretty difficult for you to check all. Tinder filter's your possible "matches" depending on the location range and gender you specific, and your common interests that's taken from Facebook*. When two people are matched, both are given two option. Keep Playing or Send a Message. Keep playing just lets the user keep on seeing more individuals but person he or she is matched with will now be added to their contacts. They can message them anytime. Send a message will open up a messaging chat box for the users to start chatting. They can still look for potential matches anytime they wished. At this point, there's nothing you can do much about. Its up to the user how they will interact. Should they add one another on Facebook? or keep talking on topics they are both interested? or probably have coffee or dinner somewhere. With the recent update, tinder introduce moments. Sadly, i don't know much about the new feature because I have to delete the app. If you want to try tinder just go to www.gotinder.com or search it on your mobile phone's app store.